Homes in Glen Ridge, NJ are known for their historical character and refined elegance. Unique design elements that reflect several styles of architecture are present in the area’s homes. A quiet charm permeates this quaint town, and we are especially proud to be a part of the interior design landscape here. House of Funk left its mark on Glen Ridge, New Jersey with interior design in a colonial revival home. I’ll dive into those details momentarily, but first, a little history on this town steeped in history. Founded in 1666, the Glen Ridge Borough we know and love was part of a vast territory that included present-day Montclair, Bloomfield, Belleville, and Nutley. Originally a farming community with orchards, water mills, and quarries, the introduction of railroads in the mid 1800s saw the borough eventually transform into an elegant residential sector. In 1895, citizens of Glen Ridge voted to separate from the larger town of Bloomfield, becoming a community in their own right. Today, Glen Ridge is a quaint town with an area of only 1.28 square miles, flanked by gas lamps that have become the town’s biggest trademark. At night, the lamp-lined streets glow pleasantly, giving the place a timeless and inviting vibe. Of the 3,000 gas lamps still in operation today, Glen Ridge boasts 665 of those important pieces of history. The borough is also an architect’s playground, with homes reflecting all types of architectural styles starting from the mid-nineteenth century on. Famed architects such as Stanford White and John Russell Pope have also left their mark on the town, designing a few homes in the area. Most notable of all, though, is The Stuart Richardson House designed by Frank Lloyd Wright. Often cited as the “most complex of the Frank Lloyd Wright New Jersey designed residences,” the angular home is an example of the architect’s self-styled Usonian houses, which convey his dream of an American landscape. 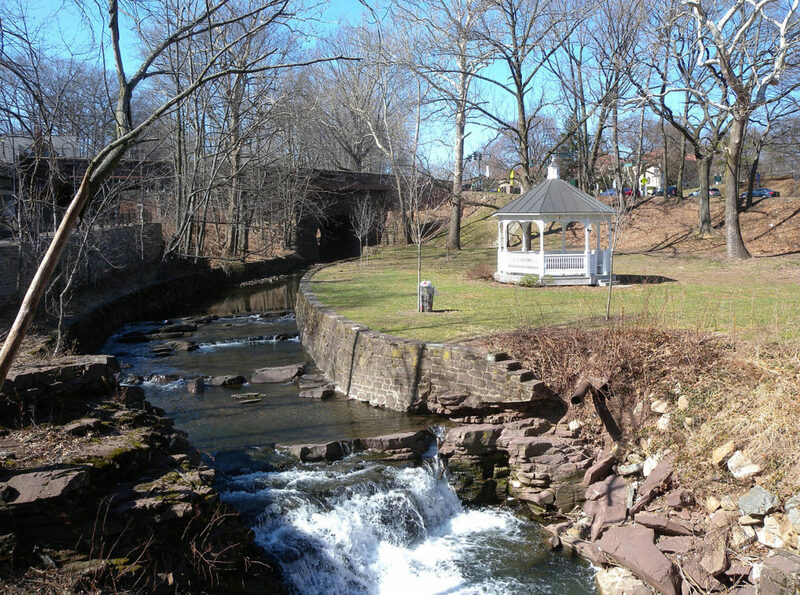 Local homeowners love the close-knit community that comes with living in this suburban town, as well as the ease of access to New York and surrounding New Jersey towns like Montclair. With nearby shopping locales and a cozy residential vibe, the borough is the best of both worlds, blending small-town charm with metropolitan convenience. 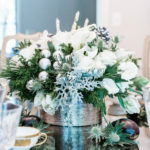 Children run and play freely, streets close down for annual block party festivities, and local organizations such as the Women’s Club of Glen Ridge support charitable causes year round. And now, a glimpse behind the scenes on one of my Glen Ridge interior design projects. The House of Funk brand reflects the tenets of our business: authenticity, beauty, and simplicity. Those tenets guide my design decisions, inform every project I take on, and infuse each and every home I work on with true soul and grit. I have to fall in love with each and every project in order to be able to design them. It’s the ‘getting happy with it’ stage, a line borrowed from one of my favorite movies, Something’s Gotta Give. It’s when the truth of the space becomes apparent and I can’t work on anything else until I capture the essence of the design. The residence I designed in Glen Ridge is a colonial revival style house built at the turn of the century. 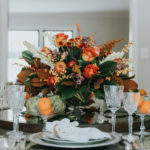 The kitchen nook pictured above features beautiful bay windows with a custom-built banquette, pops of orange in the throw pillows, a stone-top table and antique chairs. This corner of the house is a cozy retreat ideal for enjoying a cup of coffee in the morning or an after-dinner cocktail. 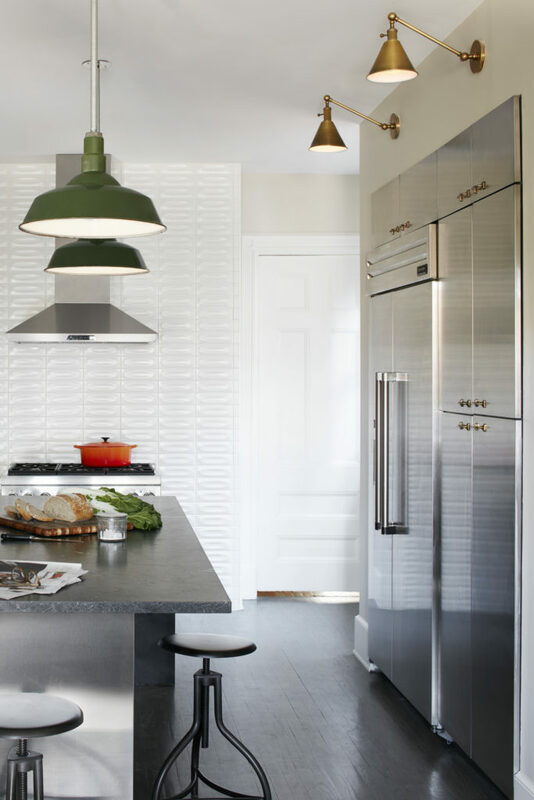 I collaborated with the clients on the design of the kitchen, powder room, and basement. One of the foremost reasons that it’s a favorite project is the amazing clients. We worked together to a stunning end. The clients are a brilliant lawyer and an accomplished architect. What could have been quite intimidating, was actually an amazing experience. We had wonderful meetings-of-the-minds over strong coffee on Sunday mornings throughout the project. In addition to the renovations, I placed over 100 pieces of art throughout the home. That, of course, was a highlight for me. To curate and display that much art that had been collected over generations was pure joy. 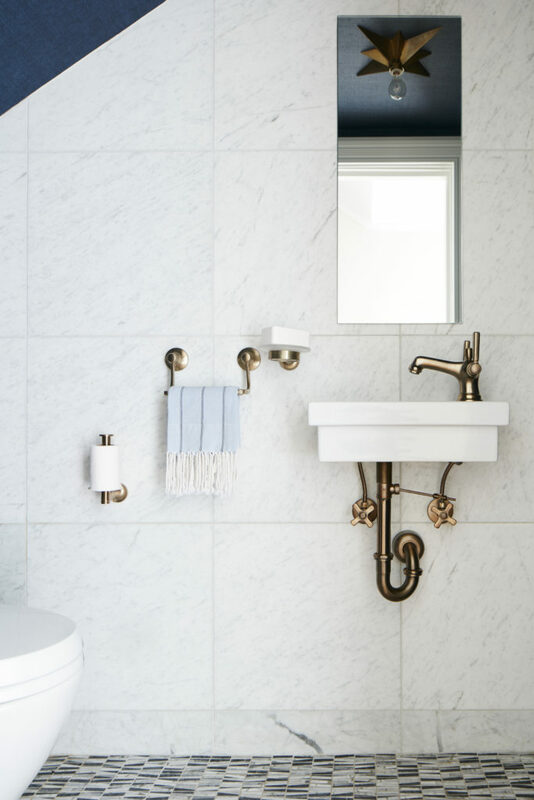 A standout detail in the powder room is the antique brass faucetry—who knew plumbing could be so chic? A star-shaped light fixture from Circa Lighting adds a hint of old-world charm, while clean, Carrara marble on the walls makes the room feel lighter and more spacious. 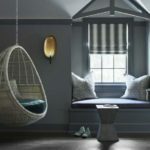 A marble mosaic was used on the floor for a contrasting effect, and to tie in with the Navy Raffia Vinyl wallpaper on the remaining walls and ceiling. The home’s foyer is classic, with elements of contemporary style woven in via the rust mohair velvet bench seat covered with Pollack fabric and framed gallery wall with frames from WadeMaxx Art & Framing. 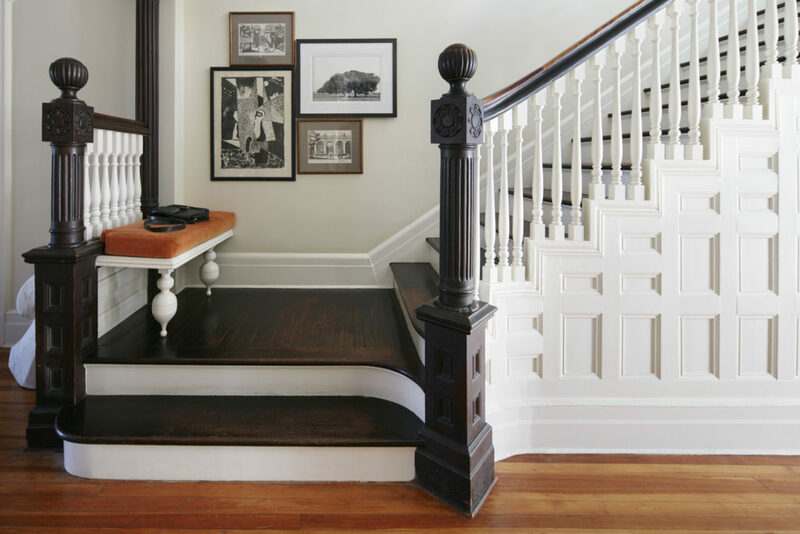 A banister railing in its original deep espresso wood is both stately and grounding, much like the home itself. The kitchen is the most captivating transformation in the house, highlighting sleek, state-of-the-art appliances and layers of finishes. I suggested reusing the Kelly-green pendants that were originally over the basement pool table over the kitchen island instead. The hanging pendants and the Circa brass hanging lights continue the clean-lined, vintage feel. 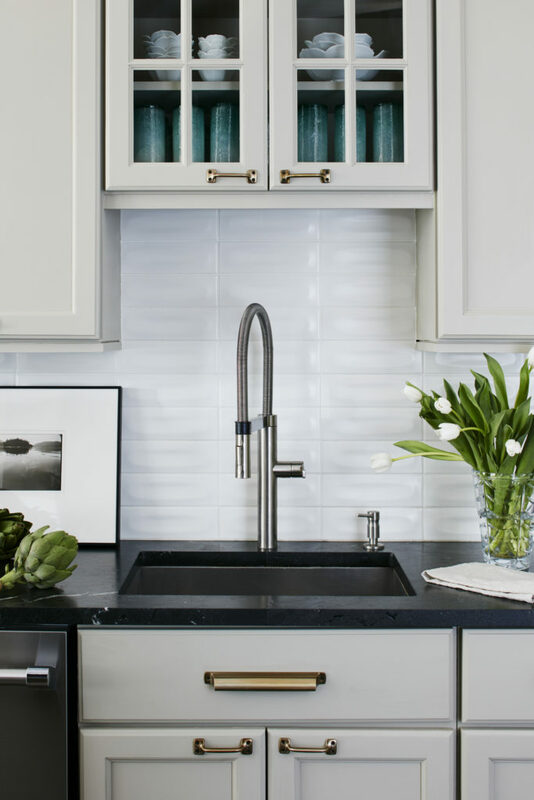 A streamlined farmhouse sink and backless stools add a minimalist touch. 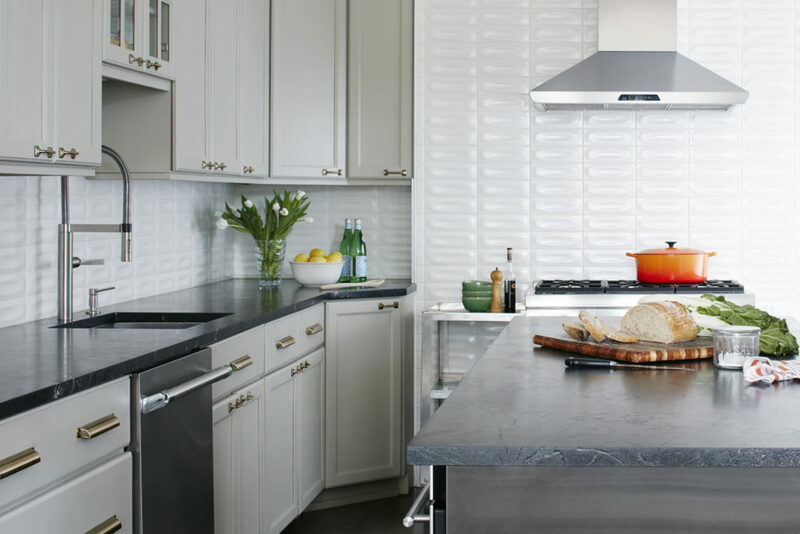 The white backsplash tile was chosen to give the space more depth and breadth. 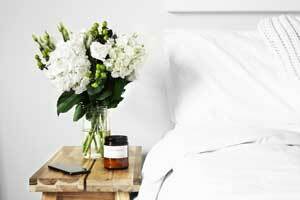 The white feels fresh and crisp against the dark wood flooring. Another showstopping feature is the granite countertops throughout the kitchen. The leather finish texture is rich and varied, and flows seamlessly in the space. 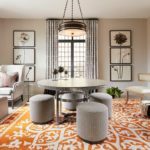 This project was an incredible undertaking, both in its detailed scope and because of how involved the clients were with all of the design decisions. Their attention to detail and respect for incredible finishes, fixtures, and artwork enabled us to do our best work possible. It was important to create a home suited for today, but designed to grow into the future, while respecting the architecture of the colonial revival home. Gorgeous! Loving the lighting over the fridge.